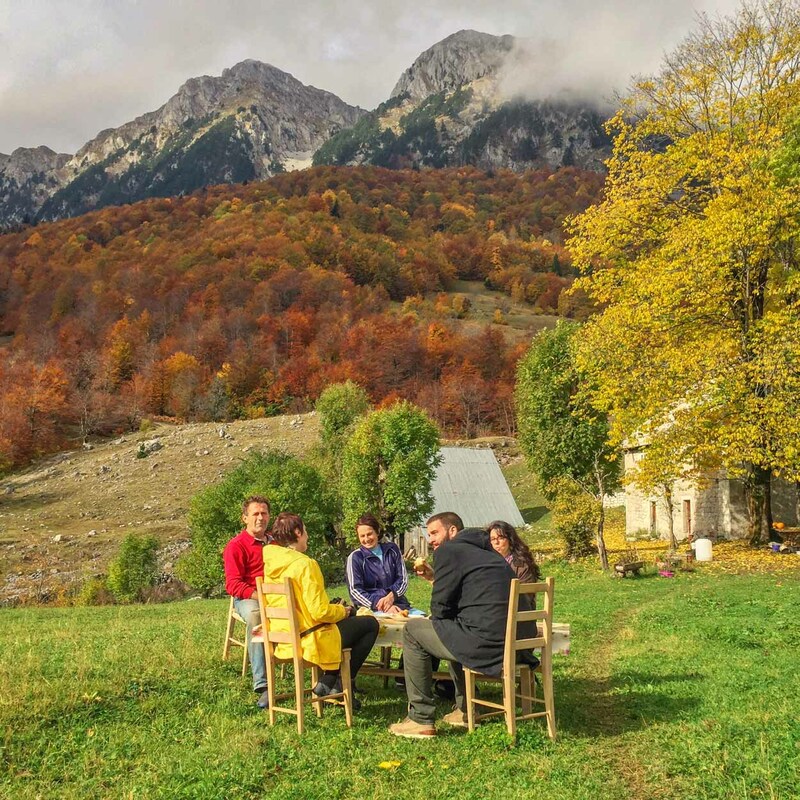 Throughout Montenegrin villages, old traditions and customs come to life daily. These chores that comprise village life are consistent, simple, organic, and beautiful. One daily task for many farm families includes making Lisnati cheese–a layered or paper cheese. Villagers make this specialty around the Kolašin region in places like Lipovo and Štitarica villages. For those that have never had the opportunity to make cheese, it is truly a fascinating process. 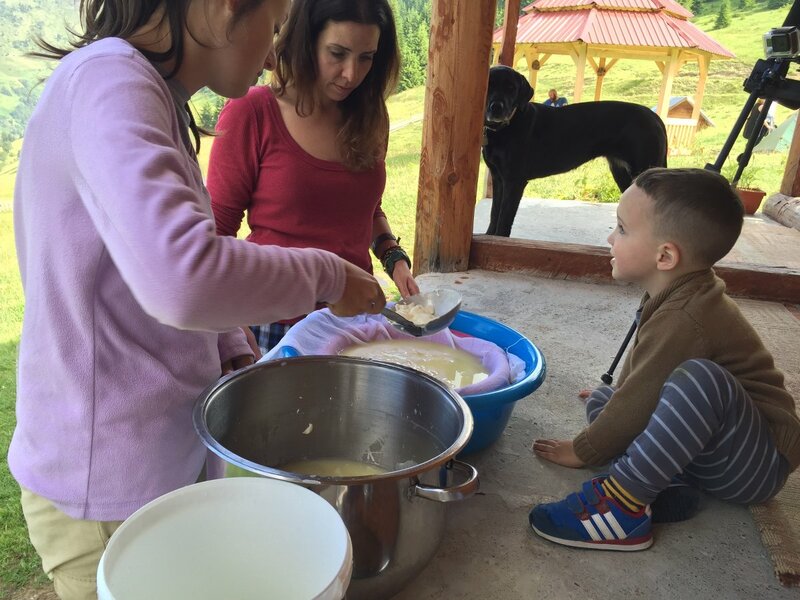 And in Montenegro, the process and art of making organic cheeses are handed down from one generation to the next. The symbiotic relationship of small family farm life makes for better organic ingredients, and in turn better foods. Cow and animal refuse make better grasses and vegetables. Better grasses make for superior eggs, milks, and meats. In the villages work roles have been delegated for centuries. 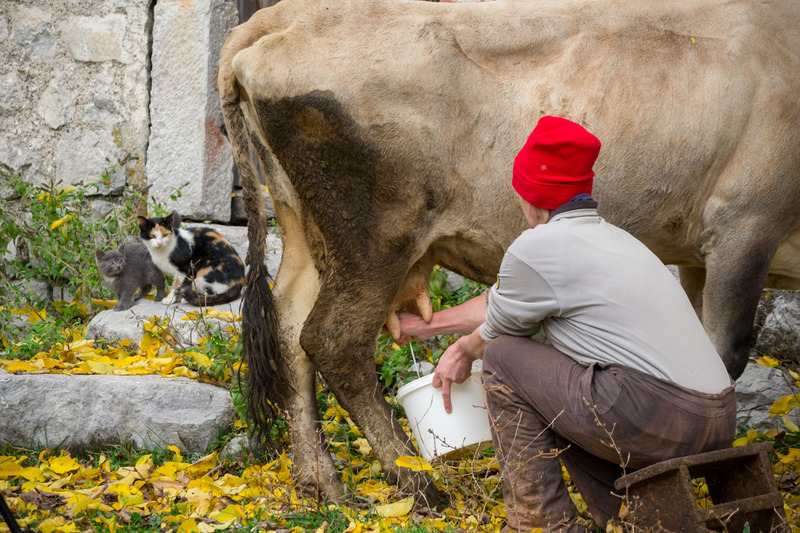 Usually, the responsibility of milking cows falls on the women. It is a daily task that must be done in the morning and evening. What do they do with all that milk? They store part of it, but the majority gets made into different types of cheese. 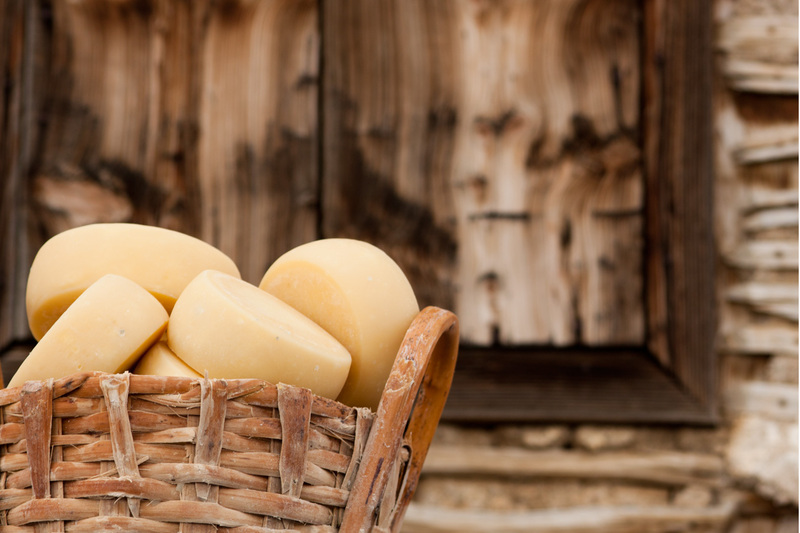 Lisnati or layered cheese is one of the most popular for Montenegrin women to make in the Kolašin region. It requires a lengthy process of folding and compressing the cheese using a robust cutting board and a heavy stone from the area. 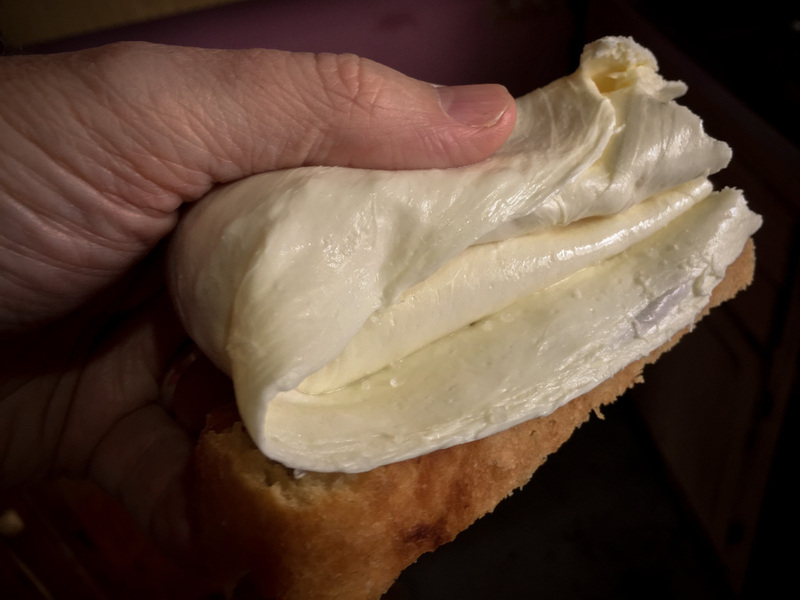 This all-day process finishes with a smooth, creamy cheese similar to fresh Mozzarella in texture and flavor. For so many of us “city folk,” it’s not every day that you see someone step out their front door to go milk their two or three cows or goats. It takes you back in time. The landowner takes her milk and patiently works with it for half of the day to produce enough cheese both for her family and to sell. She has other tasks on the farm to keep her busy as well. Her work is hard, and we salute her. It is always an honor to sit with her and share the goodness of her family farm and get a taste of her freshly made, delicious cheese. And we are always learning from her too. Combine the raw and buttermilk in a large pot and add the water. Heat the liquids over low heat until they reach 35 Celsius. Add the rennet and stir to combine. Remove from heat and let sit for one hour. Cross the mixture gently to break up the coagulation on the surface and stir every 20 minutes until it begins to coagulate throughout. Move to indirect heat and gently gather the cheese together by hand for 30 mins. Collect the cheese in a bowl and transfer to a cheese pan. Place the cutting board on top of the cheese and then place the heavy stone on top of the cutting board to add weight. For the next 30 minutes, fold and compress the cheese, every 10 minutes. As the cheese becomes more compressed, fold it every 20 minutes over a 6 hour period. Add coarse salt between the layers. Serve the cheese is ready when the layers are thin and most of the moisture has been pressed out. The villages throughout Montenegro are full of organic produce and foods. Each Montenegrin farm stay region has something that it is better known for. Here are the listings in the Meanderbug Farm Stay Network that are making lisnati cheese or other varieties on the farm or in the village. Guests are able to participate in the cheesemaking process. And of course sampling is a must.